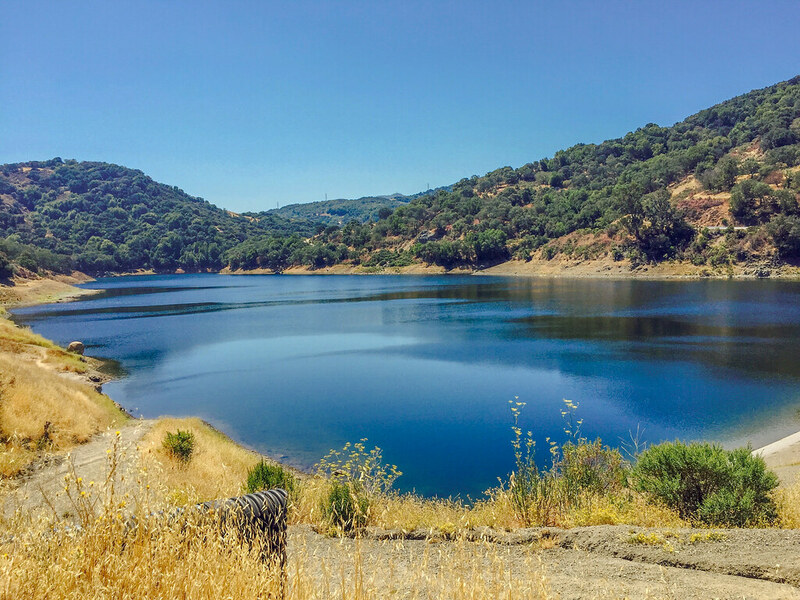 The Lower Crystal Springs Reservoir in San Mateo was a great find. The paved Sawyer Camp Trail along the length of the reservoir provides a great place to walk, run, cycle, or indulge in a leisurely stroll. We were quite late to start with the hike – 5:30 P.M.! To add to the delay, we were unable to find a parking spot close to the trailhead; we drove up and down the Stevens Creek Canyon Rd to find a designated parking place. We finally ended up parking on the side of the road just next to the trailhead. While driving south the first time, we went past the very scenic Stevens Creek Reservoir. We decided to stop here on our second round and enjoy the panoramic views while there was still ample light. 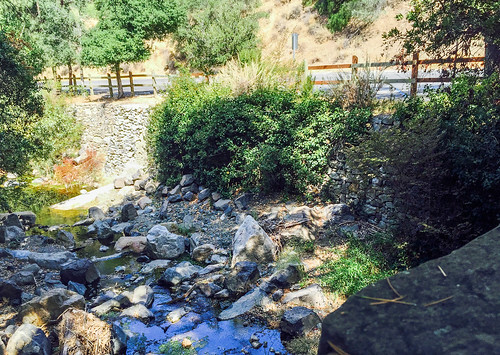 Alum Rock Park is a municipal park in east San Jose; in fact, the first one established in California! 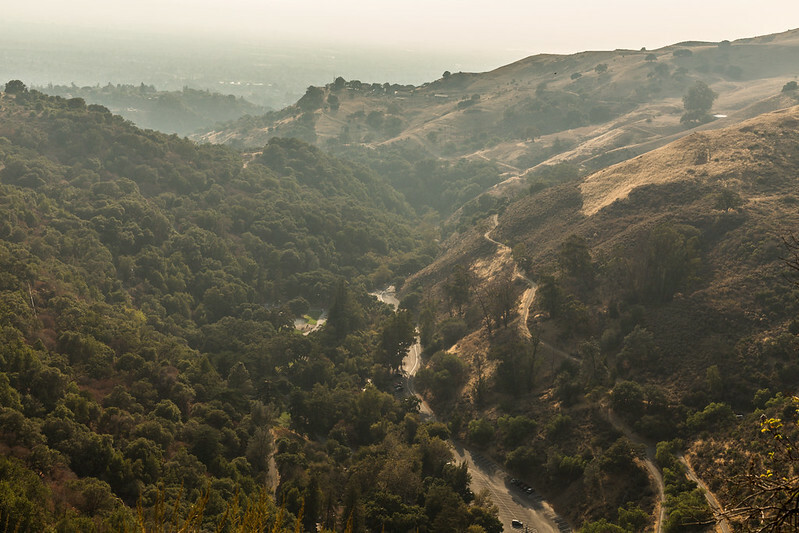 The park spans from west to east, snug within the Alum Rock Canyon, and at the foothills of the Diablo Range. One can only imagine how any hike starting from the base of a hill would be like. The South Rim Trail runs along the southern escarpment of the Alum Rock Canyon. The north and south escarpments of the canyon are characteristically different from each other in foliage – one is almost completely devoid of tree cover (North Rim Trail) and the other provides an excellent cover from the harsh summer sun (South Rim Trail). We had paid a leisure visit to the Alum Rock Park in December 2014. At that time, we did not know much about the trail system here. So we had just followed a bunch of other people and strolled on one of the trails that was flanked by a creek. We had been wanting to go back to the Alum Rock Park for some serious hiking, and so we did, in August 2015. We planned our second hike with a meetup group – Off Peak Hikes & Trips of Silicon Valley. I had been seeing an invite for Almaden Quick Silver County Park hike from this group weekly in my inbox. The group hikes in evenings on Wednesday and in mornings on Saturday. The Saturday morning hike started at 10:30 AM, which was not too early to rush for, so I immediately signed us up for the hike.